Can You Smell the Chocolate....or is it Vanilla? This week we are still experiencing a warming trend and even a bit of sunshine as this article is composed. All the plants mentioned in the last garden update are still blooming, but this week you can almost snack your way through the garden. You will have to use your imagination, but read on to understand what we mean. 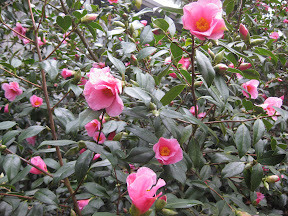 Camellias at entrance -- help us identify the type! As you come into the garden at the entrance on the left you can see the red flowers of one of the many Camellias that grow through out the garden. 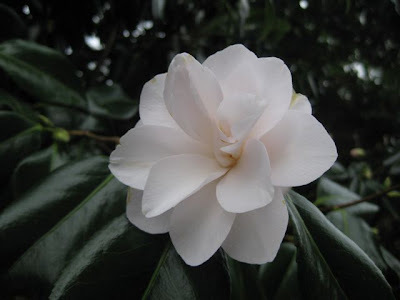 We are not sure the specific name of this Camellia – and we welcome any leads (comment on this post if you have ideas!). 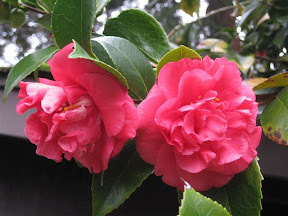 At the Visitor Center entrance the Camellia x williamsii ‘Bow Bells’ is in full bloom. The single rose pink flowers stand out against the dark green foliage. 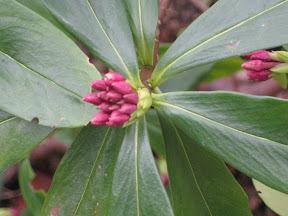 Across the main lawn you will be able to see one of the first Rhododendrons blooming. 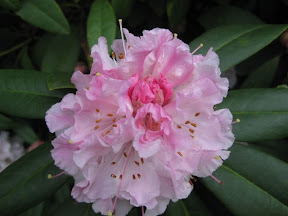 Light pink flowers cover Rhododendron ‘Rosamuni’. Further along the promenade on the right side at the pathway to the band stage the two Daphne mezereum (February Daphne) are blooming with white and purple flowers. 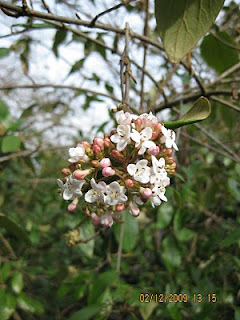 This plant is deciduous so look for small flowers on branches of the small shrubs. 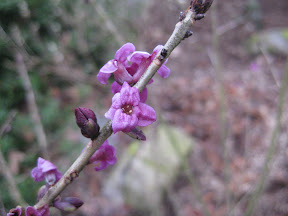 The evergreen Daphne odora ‘Marginata’ (Winter Daphne) at the pathway should have open flowers by the weekend if the warm temperatures continue. There will be a sweet scent on the air when that happens. 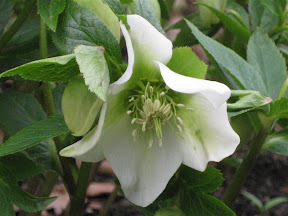 So you may be ready for your snack by the time you get to the Fuchsia bed where you will see Helleborus orientalis (Lenten Rose) blooming. (You are in front of the Administration building). Back up a bit and wander a few meters east towards the machine shop to the Azara microphylla and look at the under side of the branches. 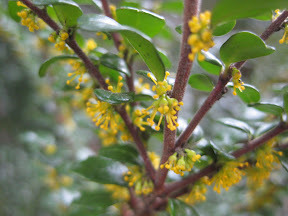 Under the very small evergreen leaves you will find tiny yellow flowers that have been opening up all week. This is where your nose will smell a different kind of sweet scent on the air. Walk around the east end of the rose garden and follow the front edge of the warehouse toward the lock wall at the end of that planting bed is the Viburnum x bodnantense we featured in the last post--right across from that you will find the Camellia japonica ‘Magnoliaflora’ blooming. 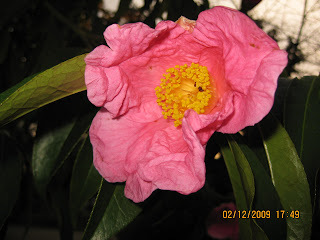 It has semi double blush pink flowers and is often referred to as Peach Blossom Camellia. As you work your way back towards the promenade you can glance out over the lawn and see that the Cherry trees are starting to bloom. Notes from the Carl S. English, Jr. Botanical Garden for January 2010. Just back in December before that week of cold weather we had over 20 plants blooming. Some were blooming out of season, but now we are seeing the usual mid winter blooms. Last Thursday while walking past the Administration Building, a fresh sweet scent was on the air. It took a few minutes to locate the source but we finally did. The Sarcococca in bed 305 planted under the Idesia polycarpa (tree #7 on 'World Tour') is currently blooming and sending the sweet smell along the promenade. 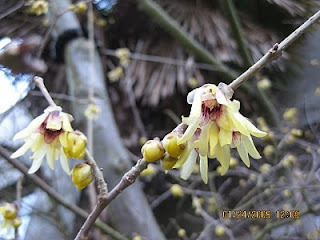 In bed 318 near the warehouse east of the rose garden the Chimonanthus praecox (Winter Sweet) is opening up its pale yellow flowers. Just above that is Hamamelis japonica (Witch Hazel), which is not quite ready to bloom. Surprising at this time of the month is the one pink red bloom of the Camellia reticulata that is right up against the same building. In planting bed 319 the Viburnum x bodnantense on the corner of the building has lots of flowers, though many are starting to fade. 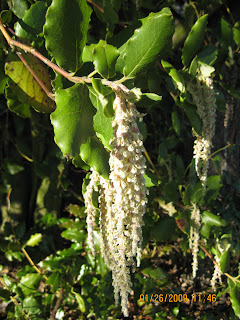 In the north nursery to the right just after the main entrance you can find a nice example of Garrya elliptica, the long catkins hanging down showing why the common name is Silk-tassel bush. 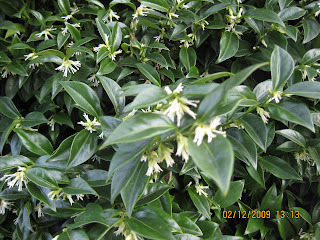 At the top of the stairs from the lock wall to the right of the house in the rockery (bed 119) the Osmanthus heterophyllus (False holly) is just opening its tiny white blooms. The fragrance is weak, but as more flowers open there should be more fragrance wafting on the breeze. Over the next few weeks we will see more plants starting to bloom. We will keep you posted via this blog. The pamphlet "Carl S. English Jr. Botanical Garden World Tour" is available in the Visitor Center.